According to IDC’s (International Data Corporation) quarterly phone tracker, released in August, Lenovo’s smartphone shipments declined by 25% and the market share shrunk to 7% in Q2 2017. Lenovo is hoping to change things in this quarter and is counting on the likes of K8 Note for it. Priced at Rs12,999, it is the first smartphone in the K series which offers plain Android experience instead of their proprietary Vibe UI. It will be available on Amazon.in through weekly flash sales and is likely to be compared with Xiaomi Redmi Note 4 (Rs12,999). Lenovo K8 Note is a metal-clad smartphone with a matte black finish. The full metal body, flat side panels which slightly arch towards the back improve grip quality and comfort levels when you are holding it. It is 8.5mm thick but feels a bit hefty at 180g. Its closest rival, the Xiaomi Redmi Note 4, is also 8.5mm thick but lighter (165g). It is also splash resistant, which means you can use it when its raining. The regular physical attributes in K8 Note are all in the right places. The dual speakers are placed along with the micro USB slot at the base, so the sound won’t get muffled when you are holding the phone. The fingerprint sensor is placed at the back right under the dual camera module and can be easily accessed. It is also accurate and fast. The volume and power keys are placed side-by-side on the right spine. They are easily accessible as they are closer to middle, but feel a bit stiff when pressed. One unique addition the phone is the dedicate music key which serves as shortcut to music apps. Long press can play/pause music, double press switches track and pressing it thrice takes you back to the previous track. Overall, the K8 Note doesn’t really stand out from other smartphones in terms of looks. The Redmi Note 4 also has a metal body and back-facing fingerprint sensor, but lacks protection against water. The smartphone sticks to the usual 5.5-inch screen size and packs an impressive resolution of 1,920x1,080p, like the Redmi Note 4. It is a good looking screen which knows how to handle colours. Video playback and games look impressive, while text in ebook and webpages looks crisp. Visibility from wide angles is good and so is the legibility in bright light. Lenovo has added a colour mode which allows one to enhance colours while watching movies and switch back to a slightly dull look while reading. The Redmi Note 4 has a slightly brighter screen, but it is more prone to scratches than the K8 Note, which has Gorilla Glass 3. The K8 Note is powered by MediaTek’s new MT6797 deca-core processor also known as Helio X23. It is a powerful processor and with 4GB RAM was able to run most tasks we threw at it with amazing grace. Even with multiple apps running in the background, games such as FIFA 16 and Big Bash 2016 played without any stutter. Unlike some of the earlier smartphones in the K series, there are no heating issues on this one. The Redmi Note 4, driven by Qualcomm Snapdragon 625 octa-core processor with 4GB RAM and 64GB storage, is quite powerful and at par with the K8 Note. The Lenovo smartphone offers 64GB storage and can take in microSD cards up to 256GB, which puts it at par with the Redmi Note 4. But unlike the Xiaomi smartphone which comes with a hybrid card tray, this one has a dedicated microSD card slot. When it comes to audio output, the K8 Note is a different beast altogether. Powered by Dolby Atmos technology, it delivers a loud and clear 360-degree sound effect in the headphone. It is an ideal smartphone for music buffs right now. With a 4,000mAh battery inside, the K8 Note can last longer than we expected. It can last a day and half of rigorous use and about 2 days on modest use, which is slightly better than the Redmi Note 4 which packs in a 4,100mAH battery. The smartphone’s key attraction is the dual 13- and 5-megapixel camera set up to create better depth of field in images. The camera is fast and supports touch to focus. The picture quality in day light is impressive for a budget smartphone. Colours look accurate, while in landscape shots, the detail it can muster is way better than the Redmi Note 4’s single 13-megapixel camera. The Redmi Note 4 also tries to play with colours for more effect. Low light output is as blurry as the Xiaomi smartphone. The 13-megapxiel snapper on the front is backed by flash and can capture clear-looking shots even in indoor conditions. 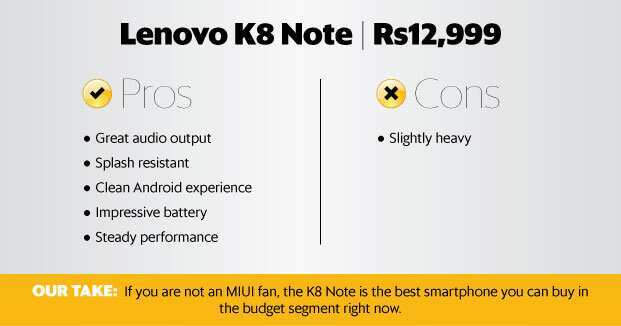 Lenovo has got most things right with the K8 Note. The dual camera, big screen, plain Android and steady performance are some of the elements which are hard to find under the same roof. The Redmi Note 4 is one of the best smartphones at this price point but the complex UI, average camera and scratch prone display, hybrid card slot are some of the features which Lenovo has taken care of in the K8 Note.